Your dad and his brothers used to have a routine where they stood around with beers in one hand and played Rock Paper Scissors. Their version involved plenty of posturing, threats, and explosive man-giggling. Fists swung to the rhythm as they chanted ONE, TWO, THREE! and then displayed their weapons: closed fist, two fingers, or a flat palm-down hand. 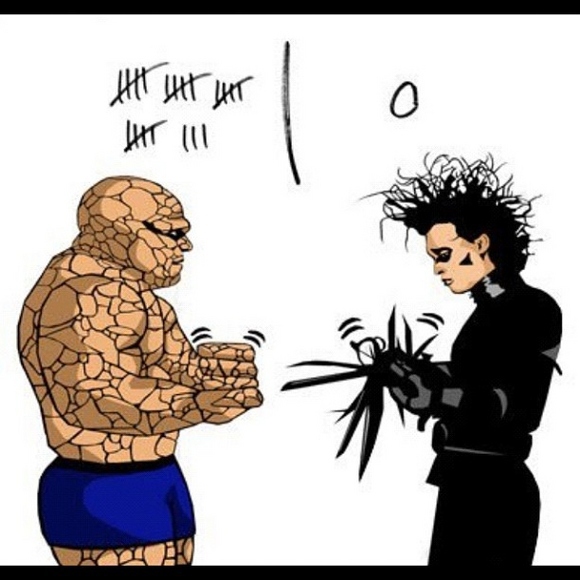 Rock smashes scissors, scissors cuts paper, and paper covers rock. In cases of ties, they immediately reset, eager to outwit and by extension outmaster. When one brother lost, he held out his bare forearm to endure the lash of his opponent’s spit-wetted two fingers. Roars ensued. Vows of reprisal. Fists raised again amidst belly laughs and trash-talk, and the cycle continued until everyone had welts peppering the tender insides of their arms. Juvenile as it sounds, you think back and realize the game bore a certain resemblance to the whole scope of life. Generally, everyone’s born with the same set of tools: your metaphorical fist, the wits to anticipate, and the choice as to which form it should take. You can smash and destroy things. You can cover up problems. Or you can change something’s physical property and make it quite new. Most of us excel at one tool or another. None of them carries a surfeit of permanent power. Like your dad and his brothers, you giggle and trash-talk your way through life—it shows you’re not afraid of possible defeat. You bite back the sting of today’s latest slap and raise your fist for the next skirmish. Scissors! Create beauty from something quite plain. Chances are you’ll win at least half the time, because of course the game isn’t really about wits, no matter how much you plan and trash talk, it’s about the probability that life will play a flanking maneuver. You’re smart enough to know this, and still you step into that ring and bare your pale forearm. “Bring it on!” you declare. “I know I’ll outwit you.” Which tool will you choose? You’d prefer to use scissors, but too often you’re forced to stuff them away while you push your Sisyphean rock, lest it smash all your work. Then there are days where you want nothing more than to hide under a blanket and avoid the clenched fist with which life has chosen to best you. As with the game, it turns out you need all three fists to succeed. Favor one tool, and sooner or later your opponent will prey on that weakness. All you’ll have to show for it are rows of throbbing red lumps. So go ahead and giggle and bluster. Show your tender-skinned arm to the world. Raise your fist high, take a chance, and play all the tools in your arsenal. Which one will you choose? This entry was posted in Uncategorized and tagged covering problems, decisions, game of life, life, rock paper scissors, Success, taking chances, weakness. Bookmark the permalink. Awesome letter. I prefer the updated version, though : rock, paper, scissors, lizard, Spock!